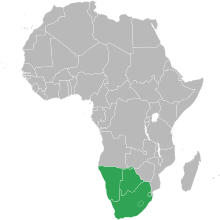 The Southern African Customs Union (SACU) is a customs union among five countries of Southern Africa: Botswana, Lesotho, Namibia, South Africa and Eswatini (formerly Swaziland). Its headquarters are in the Namibian capital, Windhoek. It was established in 1910. SACU is the oldest existing customs union in the world. The first customs union in the area was established in 1889 between the British Cape Colony and the Boer republic of the Orange Free State. In 1891 British Bechuanaland and Basutoland joined, followed by Bechuanaland Protectorate in 1893 and Natal in 1899. Parallel to this process, the Boer republic of the South African Republic and Swaziland (then a protectorate of the South African Republic) formed a customs union in 1894. Following the Second Boer War, and the establishment of British control over the Boer republics, the Southern African Customs Union was formed in 1903 with the signing of a new Convention and replaced the previous arrangements. It consisted of Cape Colony (to which British Bechuanaland had been annexed in 1895), Basutoland, Bechuanaland Protectorate, Natal, Orange River Colony (the former Orange Free State), Transvaal Colony (the former South African Republic), and Southern Rhodesia. Swaziland joined in 1904 and North-western Rhodesia joined in 1905. In 1906 another convention was signed which superseded the 1903 agreement and retained all of the previous members. In its current configuration it was established in 1910 pursuant to a Customs Union Agreement between the Union of South Africa and the High Commission Territories of Bechuanaland, Basutoland and Swaziland. Southern Rhodesia and North-western Rhodesia (later to become Northern Rhodesia after 1911) had declined to join the 1910 Agreement but did maintain a common tariff and free trade arrangements with South Africa and the High Commission Territories (with some variations and exceptions) from 1910 until 1935. An attempt was made in 1949 to re-establish a customs union between South Africa and Southern Rhodesia, but it ultimately failed to do so. With the advent of independence for the High Commission territories, the agreement was updated and, on 11 December 1969, it was relaunched as the SACU with the signing of an agreement between the Republic of South Africa, Botswana, Lesotho and Swaziland. The updated union officially entered into force on 1 March 1970. After Namibia‘s independence from South Africa in 1990, it joined SACU as its fifth member, although it had been effectively a part of the customs union from the time of its conquest by South Africa in 1915 (with the situation formalized in 1921 with arrangements between South Africa and the South West Africa). Historically SACU was administered by South Africa, through the 1910 and 1969 Agreements. The customs union collected duties on local production and customs duties on members’ imports from outside SACU. As of 2007, the Executive Secretary of the SACU was . The Current ES is , a Namibian national who assumed her duties in this portfolio on 1 April 2014 for a period of 5 years. The union meets annually to discuss matters related to the Agreement. In addition, the Customs Technical Liaison Committee, the Trade and Industry Liaison committee and the Ad hoc Sub-Committee on Agriculture each meet three times a year. Its aim is to maintain the free interchange of goods between member countries. It provides for a common external tariff and a common excise tariff to this common customs area. All customs and excise collected in the common customs area are paid into South Africa’s National Revenue Fund. The revenue is shared among members according to a revenue-sharing formula, as described in the agreement. South Africa is the custodian of this pool. Only the BLNS Member states’ shares are calculated, with South Africa retaining the residual. SACU revenue constitutes a substantial share of the state revenue of the BLNS countries. Following the formation of the Government of National Unity in South Africa in April 1994, member states concurred that the existing agreement should be renegotiated to democratise SACU and address needs of the SACU member states more effectively. With this in mind, the Ministers of Trade and Industry of the five member states met in Pretoria on 11 November 1994 to discuss the renegotiation of the 1969 agreement. The Ministers appointed a Customs Union Task Team (CUTT), which was mandated to make recommendations to the Ministers. CUTT has met on numerous occasions in the member states, and declares that good progress has been made in the renegotiation process. Council of Ministers, with one minister from each SACU member state, would be the supreme SACU decision-making body and would meet quarterly. The decisions taken by this council would only be by consensus. An administrative body composed of senior officials, three technical liaison committees and an established Agricultural Liaison Committee. An independent body of experts. It would report directly to the Council of Ministers. The tribunal would be responsible for tariff-setting and the anti-dumping mechanism. Responsible for day-to-day operations of the pool. It would be funded from the revenue pool. Its location would be determined by senior officials who were directed to meet after one month to develop proposals for the implementation of the revised SACU institutional structure. a share of a development component. The customs component, allocated according to each country’s share of total intra-SACU trade, including re-exports. The excise component, net of the development component, allocated on the basis of GDP. The development component, fixed at 15% of the total excise pool and distributed to all SACU members in an inverse proportion to each country’s GDP/capita. While SACU entered into a free trade deal with the four-nation European Free Trade Association on 1 July 2006, its negotiations with the United States for a free trade agreement have stalled (as of 8 January 2008). ^ “WTO – Trade policy review – Southern African Customs Union 2003”. www.wto.org. Retrieved 6 April 2018. ^ “Institute for Global Dialogue” (PDF). www.igd.org.za. Retrieved 6 April 2018. ^ Ali M. El-Agraa, The European Union economics and policies, Ed. Cambridge University Press, Cambridge, 2007, p.7. ^ “** Welcome to the SACU Website **”. www.sacu.int. Retrieved 6 April 2018. ^ Ndulu, B. J. (6 April 2018). The Political Economy of Economic Growth in Africa, 1960-2000. Cambridge University Press. ISBN 9780521878494. Retrieved 6 April 2018 – via Google Books. ^ “EU dismiss concerns of Southern African customs union”. wordpress.com. 3 May 2010. Retrieved 6 April 2018. ^ “Letter from SACU to De Gucht, 11 February 2010” (PDF). afrika.dk. Archived from the original (PDF) on 19 July 2011. Retrieved 6 April 2018. ^ “Letter from De Gucht to SACU, 31 March 2010” (PDF). afrika.dk. Archived from the original (PDF) on 19 July 2011. Retrieved 6 April 2018.